Since its inception in 1953, when Melbourne Theatre Company began as the Union Theatre Repertory Company, MTC has benefited from philanthropic support. As a not-for-profit organisation, and with government subsidy falling below 10% of the Company’s annual income coupled with the volatile nature of the box office, private giving plays an increasingly important role in MTC’s future. 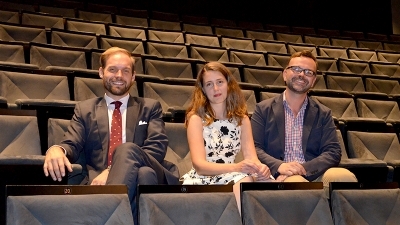 The philanthropy team stand at the helm of MTC’s private giving arm of fundraising, piloting donations across the Company to help create world-class theatre year after year. The team is Major Gifts Manager Patrick Rundle, Annual Giving Manager Chris Walters and Philanthropy Co-Ordinator Sytske Hillenius. Chris hails from the UK, where he previously worked at the National Theatre. On his first day in Melbourne, jetlagged and uncertain about the calibre of drama in his newfound city, he attended MTC’s 2014 production of Other Desert Cities. At a matinee performance filled with ‘transfixed’ school groups, Chris fell in love with an actor he hadn’t seen perform live before – Robyn Nevin. ‘I’ve been in love with her ever since and followed all her work,’ he says, ‘The whole thing was breathtaking and I came away thinking, “I want to work at MTC one day.”’ It didn’t take long for Chris to find his dream job in MTC’s Development department. Patrick Rundle, Sytske Hillenius, and Chris Walters. The MTC Ambassadors program recognises the need for passionate students of drama to have opportunities to engage in the arts beyond what is possible at school.